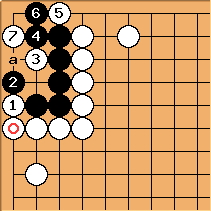 The black shape in this corner is the long L group. It controls more corner space than the L group, and this greatly improves its chances for survival. 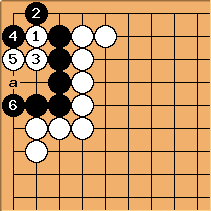 This shape is also sometimes referred to as The L group with 1 arm. This is White's best attack. She produces a somewhat strange ko in the corner. This is known as a ten thousand year ko. 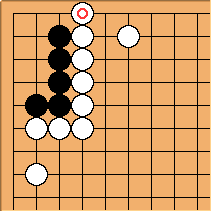 Black should not play at a because it results in a direct ko. 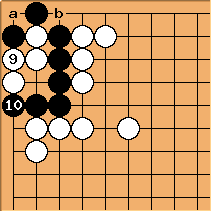 The ten thousand year ko is much better for Black. Refer to that page for more detail. When the hane stone is on this side, nothing changes. The sequence above still applies. When the hane stone is on the other side, things get a bit more interesting. 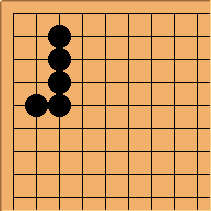 White can still get a ten-thousand year ko, but the sequence is now different. The usual clamp at does not work. 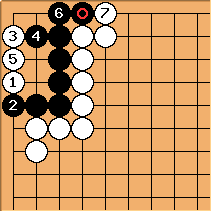 Thanks to the stone, lives, and White cannot bridge under at a. 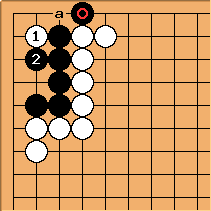 This diagram is a modified one with extra liberty at a for the black group. 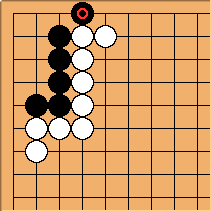 Note that Black is unconditionally alive. 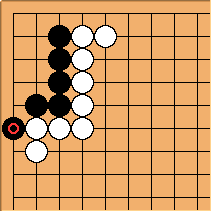 If White answers at , Black will play at . 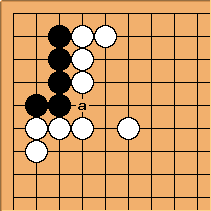 The result is a gote seki for Black - the same as living unconditionally when considered in terms of life and death. 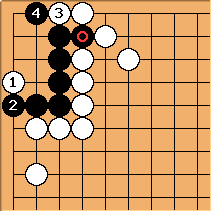 The strongest attempt for White (if White must kill) is to play atari at in this diagram. But Black sacrifies yet another stone at , and takes back with . . . 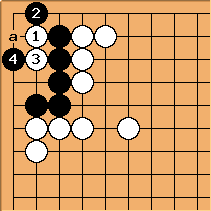 If White plays at , will cause White to be caught in a connect-and-die (a kind of shortage of liberties). here won't start a ko either. 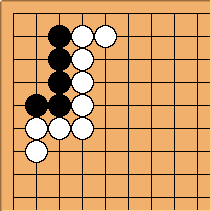 After , White at a, Black at b, it will be obvious that Black is unconditionally alive. The extra liberty comes in very handy here. 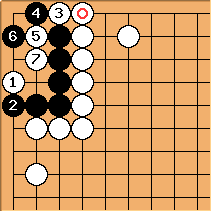 White has descended to the edge with . If Black doesn't answer, he dies unconditionally. 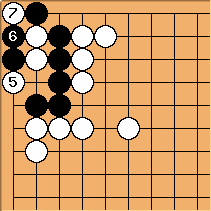 Black's attempt at a ko lacks liberties instead. 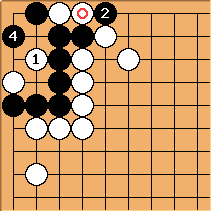 Note that can also be played at . 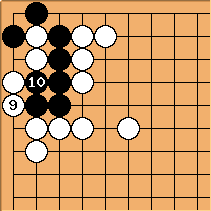 Gokyo Shumyo, Section 1, Problem 18 / Solution includes this variation. creates a defect: now is atari, making the previous diagram fail. Subsequently, if White plays at , Black lives with and . White descends the other way. 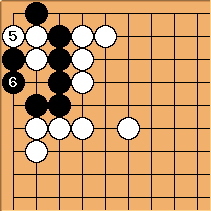 It is still the case that White to play can kill Black unconditionally. This is also shortage of liberties. Black can't play at a after .